JJean Paul Gaultier Classique Essence is a new interpretation of femininity with, for the first time, a redesigned silhouette. Jean Paul Gaultier Classique Essence keeps the gingery, almost spicy dimension, but it is made lighter, with added bite and burst. 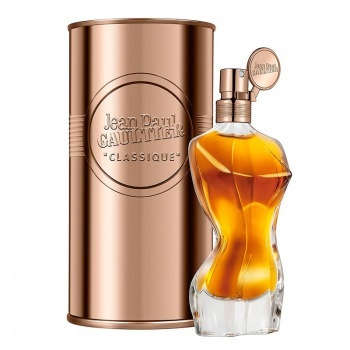 Jean Paul Gaultier Classique Essence de Parfum starts with a fresh spicy note of ginger over a soft floral heart of Sambac jasmine and orange blossom and a sultry base of precious woods, vanilla and chantilly cream.